Numerous authors have worked with this story in all possible ways – as fairy-tale, narrative, novel, drama, opera. Among the best-known works are the fairy-tale by Ludwig Bechstein, the puppet show by Georg Trakl, the narrative by Max Frisch as well as several pieces of music theatre. These include Jacques Offenbach’s operetta, the opera “Ariane et Barbe-Bleu” by Paul Dukas – as well as the probably most prominent work – the opera “Bluebeard’s Castle” by Béla Bartók. The opinion on Bluebeard and his last wife – who is the culprit? who is the victim? – has changed over the centuries since Perrault published his fairy-tale in Paris 1697. However, a very similar analysis of the “battle of the sexes” was already presented by Paul Dukas in 1907, ten years before the premiere of Béla Bartók’s work, in “Ariane et Barbe-Bleue”, his tree-act opera which was first performed at the Opera-comique in Paris. Thereby the composer set a text by the Belgian writer Maurice Maeterlinck to music. The composer, who was known to be a slow worker, took seven years to set the libretto to music, at the same time altering it to represent his own vision. The result was greeted with great and ungrudging approval, especially by fellow composers and musicians. Vincent d’Indy thought that “Ariane” was the most important piece of music drama since Wagner; Karol Szymanowski, Ferruccio Busoni or Bruno Walter considered “Ariane et Barbe-Bleu” to be the most important French opera besides Debussy’s “Pelleas et Melisande”. 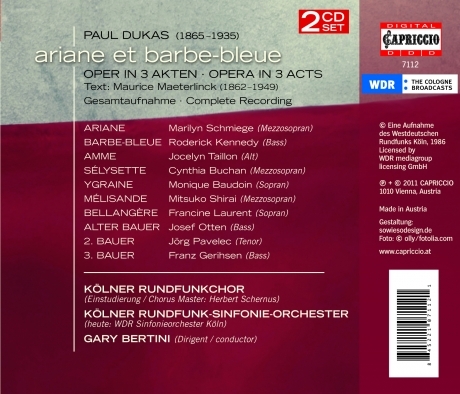 Certainly, Dukas’ music for “Bluebeard” has way less exotic flair than Debussy’s “Pelléas”. From the archives of Westdeutsche Rundfunk Köln this Studio Recording, produced in 1986, is now presented for the first time on CD. Former chief conductor Gary Bertini had a very good cast on his hand to do this interesting production.